BYRON ATHLETIC BOOSTERS STORE - Apparel and Accessories are now available to order online! Please click on the items below for item description and to order. Please allow approximately 2-3 weeks for delivery. Please note that we cannot guarantee delivery times. We always work hard to deliver all orders as soon as possible after each order deadline, depending on production capacity, and in-stock availability with our vendors. You may CUSTOMIZE any of the shirts with a name on the shirt backs at an additional charge. To customize, make selection on the page of the item you are ordering. 1. 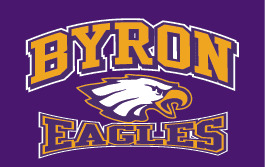 "IN-STORE PICK UP": When your order is complete, it will be delivered to you through the Byron Athletic Boosters. 2. U.S. MAIL: When your order is complete, it will be mailed via U.S. MAIL services to the address on the order. There is an additional charge for this option (cheapest of the home delivery options). 3. UPS GROUND - When your order is complete, it will ship UPS GROUND service to the address on the order. There is an additional charge for this option (most expensive of the home delivery options).